Heading to Herb Garden Weekend at the Regenstein Fruit & Vegetable Garden on Saturday or Sunday? Be sure to check out the really interesting triangle bed at the entrance to the small-space garden (hang a left at the paw paw tree). 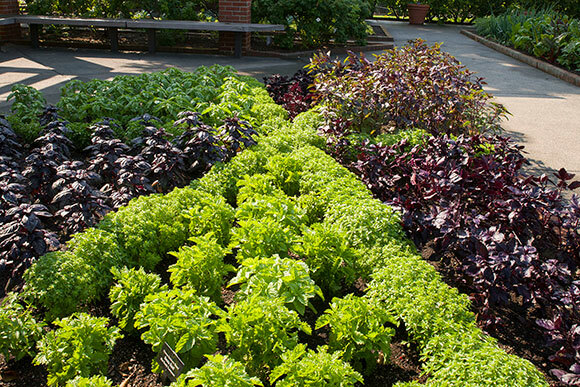 Seven types of basil (listed below) are planted in the basil bed at the Regenstein Fruit & Vegetable Garden. ‘Dwarf Fine Bush’ – The neat round globes that divide the pinwheel pack a big punch in those tiny leaves. This basil is highly aromatic, rich with cinnamon/anise/clove flavors. Although the leaves are too little to pluck for pesto, sprinkle them on hors d’oeuvres, or use them as a garnish on any dish. Really nice for nibbling, too. 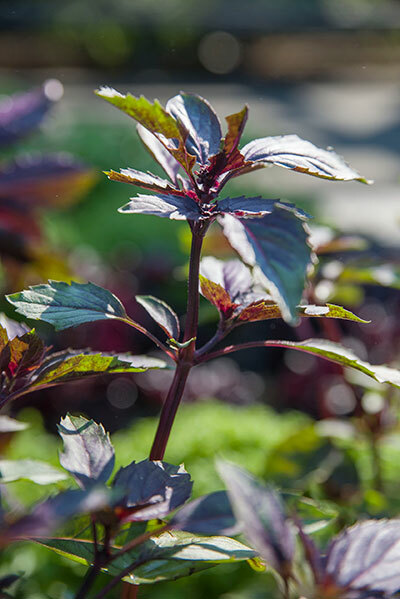 ‘Crimson King’ – It’s a Genovese-style basil, with big, curvy leaves, colored purple instead of green—the better to stand out in vegetable dishes, layered in a sandwich, or as a revelation with rice. And it’s our Plant Giveaway for August (pick up a seedling Wednesday through Sunday, 11 a.m. to 4 p.m.). ‘Serata’ – As the name says, this is basil with serrated edges. Big, ruffly, bright green leaves make ‘Serata’ pretty enough for the front of the flower bed. But it’s truly tasty, too, with real basil flavor, so it’s a great choice for pesto. ‘Ararat’ – Showstopping in a pot on a sunny porch or patio, bicolor ‘Ararat’ is green wherever it’s not purple. Its licorice taste immediately challenges your inner foodie: Salads? Tomato dishes? Ice cream? ‘Genovese Compact Improved’ – A relative of the classic Genovese, this is more compact in overall size. With the same big leaves and concentrated, sweet flavor—though more noticeably less anise in taste—this is the perfect basil for pesto. ‘Purple Ruffles’ – The name tells you what you need to know: it’s a beautiful basil, with a more complex cinnamon/spice/mint/anise flavor. Steep it in white wine vinegar for fresh vinaigrettes all summer and fall. ‘Purple Osmin’ – Fruity and sweet, this is one of the darkest of all basils, and delicious in Italian and Thai recipes. Check out the kitchen garden bed just outside of our demonstration kitchen window and you’ll find two more interesting basils. ‘Sweet Thai’ – The distinctive spicy flavor of anise and clove make this the basil for red and green Thai curries and pho. Its purple flowers mix nicely in container or window box plantings. ‘Mrs. Burns’ Lemon’ – Pluck the lemony leaves for iced teas and lemonades, and use them generously when grilling. That’s nine basil varieties to add to your summer repertoire. Need a kickstarter recipe? Garden Café executive chef Paul Choi shares his lemony pesto recipe below. Use scissors to clip individual basil leaves from the plant rather than tearing them off—much neater! Harvest basil branches with a clean cut across the stem, then stand them in cool water ‘til you’re ready to use. Harvest a whole plant by cutting straight across the main stem, leaving at least one leaf node with two shoots—the plant will rebranch from there. Start a new batch of seed every month from February (indoors) through September (bring plants in if nighttime temperatures dip below 50° F.) for a continuous, fresh supply. Picked too much basil (is that possible)? Chop extra leaves, layer them into ice cube trays, fill with water or olive oil, and freeze. The individual cubes are great for cooking. *Chef Choi prefers two for a zingier taste. Place the pine nuts, garlic, and basil in a food processor. Process for about 30 seconds or until everything is chopped. With the processor running, slowly add the oil until the pesto is thoroughly puréed. Add the rest of your ingredients and purée until all are incorporated. Store the pesto in the refrigerator for up to three days. The pesto must be stored with plastic wrap or another cover to keep air out. Or freeze in ice cube trays—just add a cube to any dish for extra flavor. 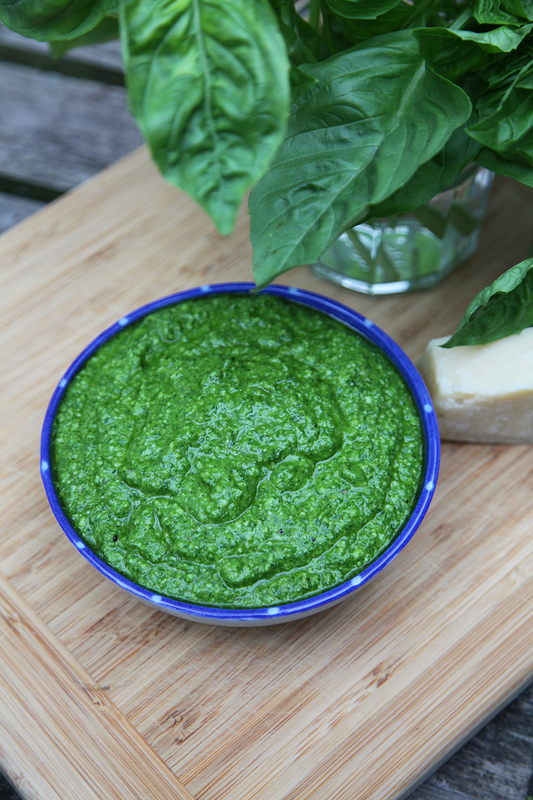 Thanks very much to share recipe how to make pesto. I like basils. I always use for my meal (vietnamese food). I growing outside the balcony, they easy and grow up quickly…and the flower smell good.